The International Communion of Charismatic Churches, also known as The I.C.C.C., was founded in 1982 and represents an inclusive coalition of national and international ministries. The group was originally called the World Communion of Pentecostal Churches and represented a visible expression of the Charismatic dimension of the church. In its inception, the non-profit organization was used to promote dialogue and unity between historic churches and Charismatic Renewal churches. In recognition of the historical and spiritual renewal of the past century, the I.C.C.C. sought to provide a trans-denominational forum that would facilitate the exchange of ministry resources, ideas, counsel, and spiritual direction among the leaders and churches represented. Over the years The I.C.C.C. promoted national and international mission teams of ministry leaders, educators, and related advisors to facilitate the development of schools, model ministries, media outlets, and the ongoing growth of membership churches. Annual conferences were held in strategic national and international sites to equip and train leaders and members while also providing a forum for cross-cultural and cross-denominational fellowship. The theological agenda of The I.C.C.C. has been and continues to be the proclamation and demonstration of the principles and strategies of the Kingdom of God among its members. The publication of books and papers by its membership has proven to be helpful in achieving this agenda. The political and social agendas of the organization has been and continues to be achieved through the development of national and international Christian networks and coalitions. The I.C.C.C. is committed to the highest standards of moral integrity, the proclamation of the redemptive work of Calvary, the training of leaders that exemplify character, and to the equipping of the next generation to fulfilling Gods' purpose on the earth. In 1975 David DuPlessis (known as Mr. Pentecost) was called upon by Pope Paul VI to create and mediate the Roman Catholic-Pentecostal Dialogues. The purposes of the dialogues were to foster understanding and to create room within the Roman Catholic Churches for the many Roman Catholic members who were fleeing the Church for Pentecostal Churches and denominations. The Pope thought that by creating this partnership the Roman Catholic members would be kept in the fold. In 1976, David DuPlessis brought Robert McAlister into those dialogues. McAlister was leading a major Pentecostal reformation in Brazil among Roman Catholics and Pentecostals alike. He was the son of the former General Superintendent of the Pentecostal Assemblies of Canada (the Canadian branch of the Assemblies of God). Those dialogues continued from 1976-1978 under Pope Paul VI and for a brief tenure under Pope John Paul II into 1979. David DuPlessis recommended that McAlister seek special recognition from the Vatican to be sanctioned a bishop with special privileges to be a bridge between Rome and Pentecostal denominations. At the time, the majority of McAlister's congregation was comprised of mostly former Roman Catholics. There was a strong consensus among those involved in the dialogues that it was indeed time for such an office but for the Vatican to perform or sanction such office would create a precedence that could undo history and establish division within the Roman Church. The possible division could parallel or exceed the split between the Roman Church and the Greek Orthodox Church. The Apostolic Counsel recommended that Robert McAlister should apply to the Anglican Church for consecration and then partner back with the Roman Church upon his acceptance by the Anglicans. The Pope then agreed that upon duly being consecrated by the Anglicans he (Pope Paul VI) would sanction McAlister as a special liaison to the Pentecostals. In 1977 the Anglican Church rejected the appeal of McAlister to the office of the bishop citing "his emphasis on Pentecostal experience" as the reason of his rejection. It was at that time that David DuPlessis and John Meares went to Brazil in 1978 to ordain McAlister as a bishop. Since Meares and DuPlessis were not bishops, the ceremony was not considered official. Pope Paul VI was made aware of the ceremony during the 1978 dialogue and saw it as a gesture of genuine unity with the historic church. While many felt it was an insult to the Roman Catholic Church, the pope defended the actions of the three Pentecostals and called for McAlister and DuPlessis to be brought before him for commissioning as bishops of special recognition and rights. This would establish both McAlister and DuPlessis as direct descendants of apostolic succession. Even though the decision created much turmoil within the Roman Catholic-Pentecostal Dialogues, the Pope's decisive action and favorable response to the Pentecostals did indeed establish a historical tie to the papacy. Many of the Roman Catholics felt that by recognizing what appeared to be a renegade liturgy there would be a cheapening of the traditions and liturgies that were uniquely Roman Catholic Church. To alleviate the concerns of the Roman Catholics, it was determined and agreed that the Pentecostals would draw from the heritage of the "high church" but would not seek to duplicate the liturgies. Instead they would create their own rites and ceremonies in a way that would bring compliment and comparison to the cooperative fellowship. On that day in 1978, as a peace gift of the Roman Catholics to the newly recognized Pentecostal bishop, a purple stole was given to both Bishop DuPlessis and Bishop McAlister. In the presenting of the stole, it was stated that the Roman Catholic bishops wear Roman colors to identify with the history of the Church and the blood of the martyrs while the Pentecostals would wear the Purple stole to identify with the blue of heaven and the blood of the martyrs combined thus signifying the Pentecostals having experienced "the heavenly sound." As a result of this decision, in 1986 the deep purple color was adopted as the official liturgical color of the bishop of the Pentecostal Reformation within the International Communion of Charismatic Churches. The dialogues continued for a brief tenure under Pope John Paul II for he was very favorable to the Pentecostal experience. However, in 1979 there ended the combined Apostolic Counsel citing the fact that the "charismatic Catholics" continued to abandon the Roman Church in spite of their efforts to "create unity" and keep them within the fold. Pope John Paul II however, reaffirmed his belief that the dialogues were profitable and beneficial to the future of the complete church and should be preserved throughout history. In 1981 Bishop McAlister, upon the recommendation of David DuPlessis, consecrated John Meares as a bishop (placing him in line of succession). The three of them formed a College of Bishops to govern in Pentecostal ecclesiastical matters. In 1982, Bishop Robert McAllister, in agreement with the College of Bishops, consecrated Earl Paulk a bishop, thereby placing him in line of succession. 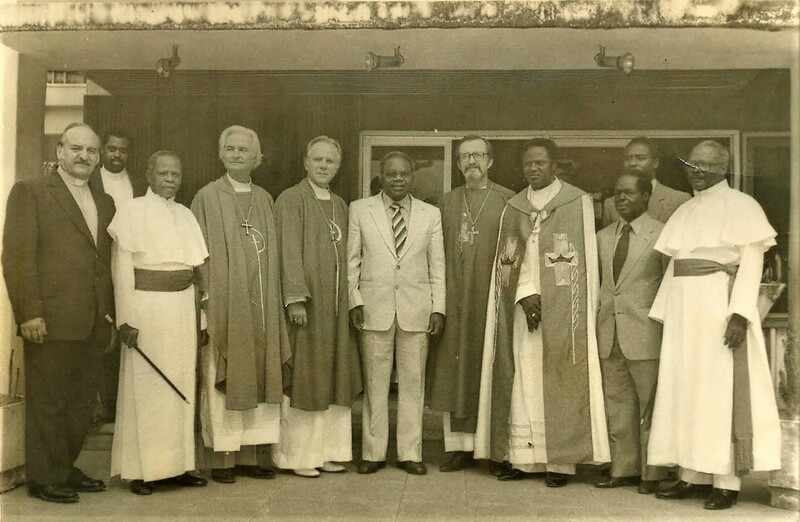 Shortly thereafter, Bishop McAllister, acting as the Primate, and Bishop Meares, functioning as the Prelate, consecrated Bishop Benson Idahosa (placing him in the line of succession). McAlister, Meares, Paulk and Idahosa , as the original College of Bishops, established the World Communion of Pentecostal Churches which would later be renamed The International Communion of Charismatic Churches. This organization was to be the fulfillment of the commissioning of Bishop McAlister by the Vatican and Pope Paul VI. That same year, Bishop Harry Mushegan and Bishop Herro Blair were added to the College of Bishop, thereby placing each of them in line of apostolic succession. At the death of Bishop McAlister, Bishop John Meares was unanimously selected to be the new Presiding Bishop. He served until 1985 when he announced his retirement and Bishop Earl Paulk was selected the new Presiding Bishop. During the early days of the tenure of Bishop Earl Paulk, Archbishop Benson Idahosa served as Coadjutor. From 1985-2005 Bishop Earl Paulk served as the Presiding Bishop of the College of Bishops. In 1997 Bishop David Huskins was consecrated a bishop by Presiding Bishop Earl Paulk and Archbishop Benson Idahosa thus placing him in apostolic succession. He was later named the Vice President (Coadjutor) of the International Communion of Charismatic Churches. Upon the resignation of Archbishop Earl Paulk in 2005, Bishop David Huskins was unanimously selected the Presiding Bishop and was duly installed in February of 2006 and remained Presiding Bishop until December 2015, when Archbishop Kirby Clements, Sr. was unanimously selected as Presiding Bishop. The International Communion of Charismatic Churches has continued to grow and expand around the globe as evidenced by the recent participation of the Monsignor of the Roman Catholic Church of Curacao during the consecration of the first I.C.C.C. bishop in the Netherlands. Copyright© 2006 International Communion of Charismatic Churches. All rights reserved. © 2016 - 2019 International Communion of Charimatic Churches - All Rights Reserved.